"SURPRISE!! Bet you didn't expect to see us, did you?" Those were the words I heard when I stepped out onto the deck, where there was an unexpected party going on in an old, forgotten flowerpot. Last year I bought some stargazer lily bulbs. I had great plans of creating a bed of one of my favorite flowers. I like lilies of all sorts, but stargazers--ummm. There's something about their bold color and heady fragrance that mesmerizes me. Like so many of my great plans, my stargazer lily bed never came to pass. The bag of bulbs lay in my garage, forgotten. Finally one day I noticed it. Most of the bulbs had rotted, but there were a few that appeared to still hold some life. I threw those into a pot, and after several weeks I had some lovely blooms. I snipped them and brought them into the house. I never touched that pot again. End of stargazer story. Until this spring, when that neglected pot showed signs of life. I thought to myself, "Could those bulbs have survived the winter in that tiny pot?" It seemed highly improbable, and I got busy with other things, never thinking again about those flowers. Yet they had survived. Those tiny shoots pushed right on up, and up, and up, and this week produced three of the most beautiful flowers I've ever seen. They made it all on their own, without one bit of help from me. They survived a mean winter without any care. They grew and managed to produce three blooms without good soil or fertilizer. And now here they are, charming me with their color and fragrance. I am all at once happy to have these three blooms . . . and sad that I didn't cultivate that lily garden. God blessed me with these beautiful flowers in spite of the fact that I did nothing to tend to them. That thought thrills me and makes me grateful. I'm grateful that the Lord is always at work in my life, bringing forth beauty even when I don't cultivate it. But seeing these three little flowers makes me wonder what might have been if I had cooperated just a little. Those bulbs were obviously good bulbs; what might have been if I had planted all of them? What if I had gotten them into the ground, rather than just tossed them into a pot? What if I had watered them and given them a bit of fertilizer? Could I have had lots of flowers? Might I now have enough flowers to share with others? The apostle Paul says, "He who sows to his own flesh will from the flesh reap corruption; but he who sows to the Spirit will from the Spirit reap eternal life" (Galatians 6:8). Paul's analogy is instructive. A farmer is helpless to grow grain; all he can do is provide the right conditions for the growing of grain. He cultivates the ground, he plants the seed, he waters the plants, and then the natural forces of the earth take over and up comes the grain. This is the way it is with the Spiritual Disciplines--they are a way of sowing to the Spirit. The Disciplines are God's way of getting us into the ground; they put us where He can work within us and transform us. By themselves the Spiritual Disciplines can do nothing; they can only get us to the place where something can be done. They are God's means of grace. The inner righteousness we seek is not something that can be poured on our heads. God has ordained the Disciplines of the spiritual life as the means by which we place ourselves where He can bless us. I am constantly amazed at how God blesses me and how His spirit brings forth fruit in my life even without much effort on my part. But looking at these few lovely flowers renews my desire to do a little more in the cultivation of my heart and life. A little more time spent in prayer, meditation, study, solitude, confession . . . these simple efforts on my part will get me a little deeper into the ground, a little more firmly rooted, a little better fed. And then I can grow and bear fruit, just like I've always wanted. the lilly blooms are gorgeous. the women in my church have been working with a shelter for victims of human trafficking. i find myself thinking "what if" a lot but also grateful for those who do come in off the street & are rescued. i pray psalm 1:3 & proverbs 3:5-6 for those who are. your post sent me thinking about them &, also, about how very undisciplined i've been this summer about being in the Word & spending real time with Him. Lovely post! 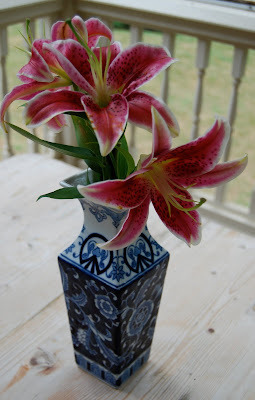 What a lesson from your lilies! What gorgeous blooms & what a beautiful post. It's so amazing to me too how the Lord covers over & blesses us even when we don't deserve it with little surprises like that. :-) Hope you have a blessed & safe 4th! Beautiful blooms!! You are a beautiful person, inside and out. :) I hope you all have a wonderful 4th of July! Oh, those are beautiful. I've got some stargazers planted and always love to see them bloom. This year, they didn't do quite as well as last, but I still got some nice blooms to cut and bring in the house. those lilies are stunning. i love that God gave you what is, no matter what He thought about what could have been. i love His surprises... who else but He would shower us with lilies of grace? lovely post and beautiful blooms. Flowers are lovely!! As for CSN - they have contacted a few times thru mmy blog and I had a giveaway, one a giveaway and this time they asked me to review an item of my choice....I think the whole site is similar to Amazon.com.....a whole site of many online retail stores...they ship quickly and they seem to have a variety of items....however I would rather shop in a store than online and i rarely buy online - hope that helps...happy 4th! Thank you very much for your kind words on my new haircut and weight loss. You really made me smile. I had some beautiful flowers come up in various pots that I also had not done anything with. They went through quite a bit of snow last year and cold weather. yet they still came back. I am a new follower! Come visit Mama's Little Chick when you can! I hope you have a great 4th of July!